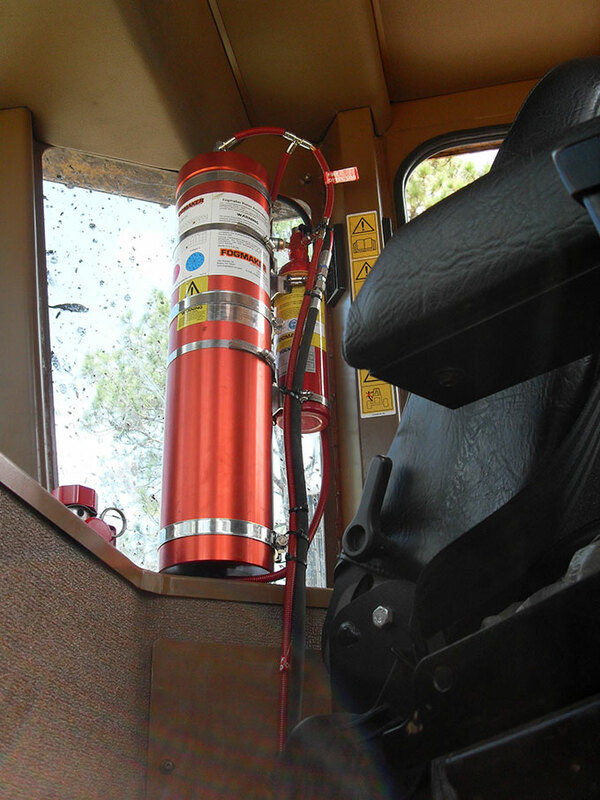 Fogmaker reduces risk of fire in forest machines with unique fire-suppression system. 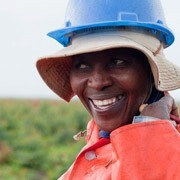 South Africa‘s plantation area covers more than 1.5 million hectares, stretching over five provinces – Limpopo, Mpumalanga, KwaZulu-Natal, the Eastern and Western Cape. 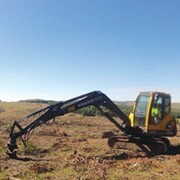 “With the forestry industry in the summer rainfall areas nearing the fire season, forestry machinery not fitted with a fire suppression system will be at high risk,” warns John Russell, Managing Director of Fogmaker South Africa, industry-leading supplier of high-pressure water-mist fire suppression systems. 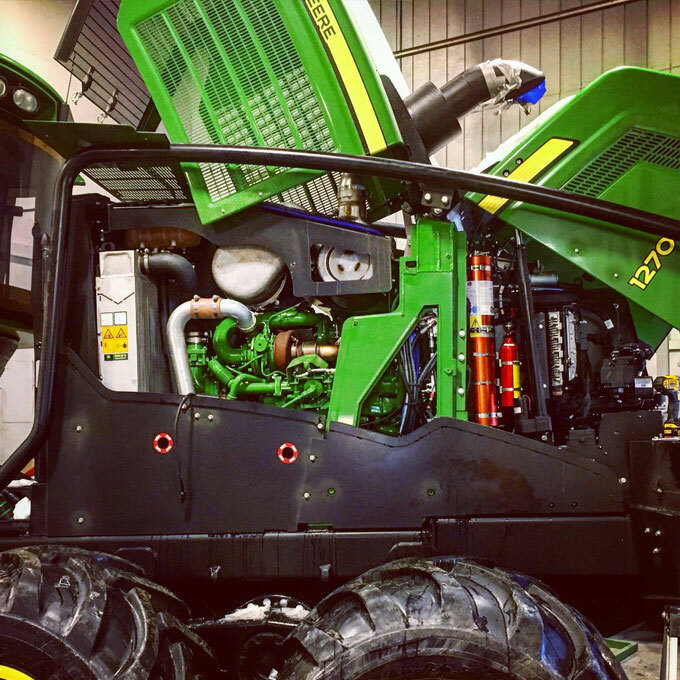 Russell adds that the retrofitting of fire suppression systems to used machinery is also expected to become a prerequisite in the not-too-distant future. 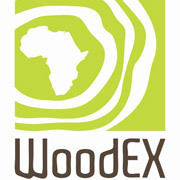 Numerous smart Original Equipment Maufacturers (OEMs) and forestry contractors who have already equipped their forestry machines with the Fogmaker high-pressure water-mist fire suppression system have peace of mind, assured in the knowledge that not only are the environment, people, animals as well as capital equipment protected, but that the risk of downtime and subsequent loss of production is also minimised. 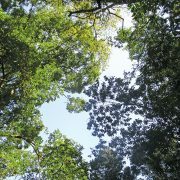 Fogmaker installation in forest machine. 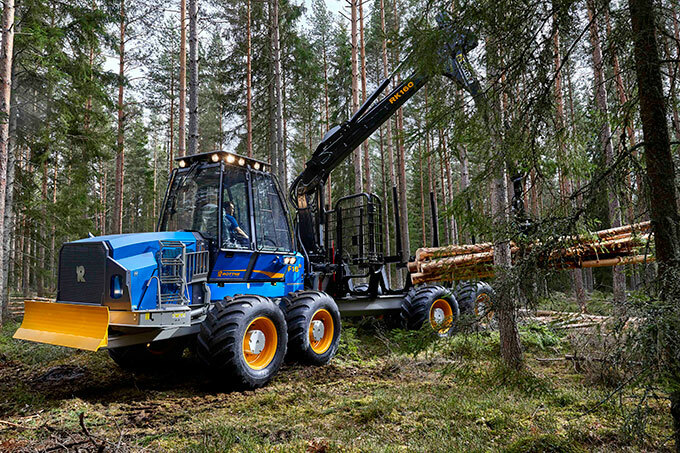 Designed specifically for engine compartments and enclosed spaces, Fogmaker can be installed on virtually all forestry machines including hybrid harvesters, skidders, haulers, loaders, as well as hauler loaders and can even be fitted to bakkies. “We work closely with OEM suppliers and integrators and we are proud to announce that Fogmaker is the standard OEM fire suppression system on the AHWI mulcher,” confirms Russell. Equipped with automatic hydro-pneumatic fire detection, both the detection and suppression system work independent of any power source. 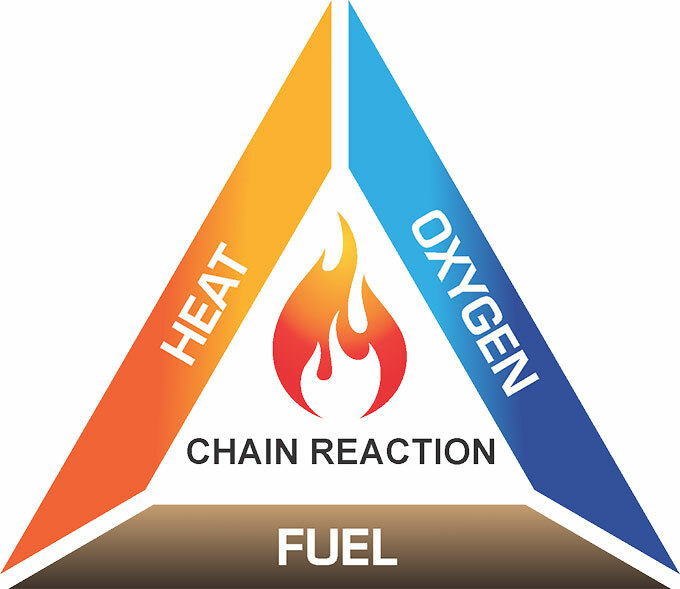 This low-weight, low-maintenance Fogmaker system is simplicity itself and makes use of the purest extinguishant, water, combined with 3% Aqueus Film Forming Foam (AFF), to attack all three elements in the fire triangle, namely heat, oxygen and fuel, and the chain reaction between them. Russell states that “We call this Fogmaker’s TRIPLE ACTION3 effect”. Using high-pressure (100 bar) water mist, the system effectively suppresses the fire and cools down the compartment to prevent re-ignition, “The use of water in the form of mist (50-micron droplets) presents an additional fire-fighting benefit that no other fire-fighting agent has,” states Russell. “The significant number of droplets together with the large combined hot surface area effectively blocks radiant heat by absorbing and scattering of heat radiation and reducing damage within the engine compartment. High-pressure and consequently high discharge speed is required to ensure that the mist reaches the flames and penetrates the outward flows induced by the fire. The system is fitted with patented high-pressure nozzles to ensure good penetration of droplets into the fire as well as efficient cooling and oxygen depletion due to the respective fast vaporisation and the expansion of vaporised droplets. The patented discharge piston accumulator allows for a complete discharge regardless of its orientation, either vertically or horizontally, leading to a versatile installation footprint. 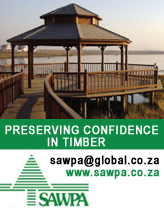 This, together with a compact, neat design, enables the system to be fitted in confined, internal compartments and out-of-the-way spaces offering protection against falling trees and branches and avoiding hindrance to general machine maintenance. 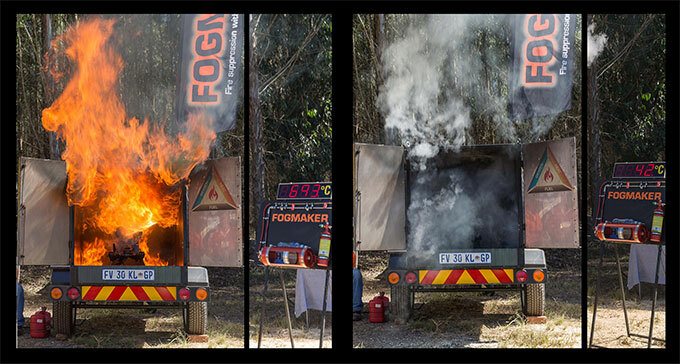 Fire suppression test by Fogmaker at the Focus on Forestry Field Day, Howick. As there is no powder or mess to clean-up after actuation, resetting of the discharged Fogmaker water-mist fire suppression system is simpler, easier, faster and more effective than powder or foam suppression systems. “After a discharge, it’s a simple matter of replacing the detector hose, replacing the nozzles, and refilling the piston accumulator, thus keeping costs and downtime to the absolute minimum for the end-user,” says Russell. 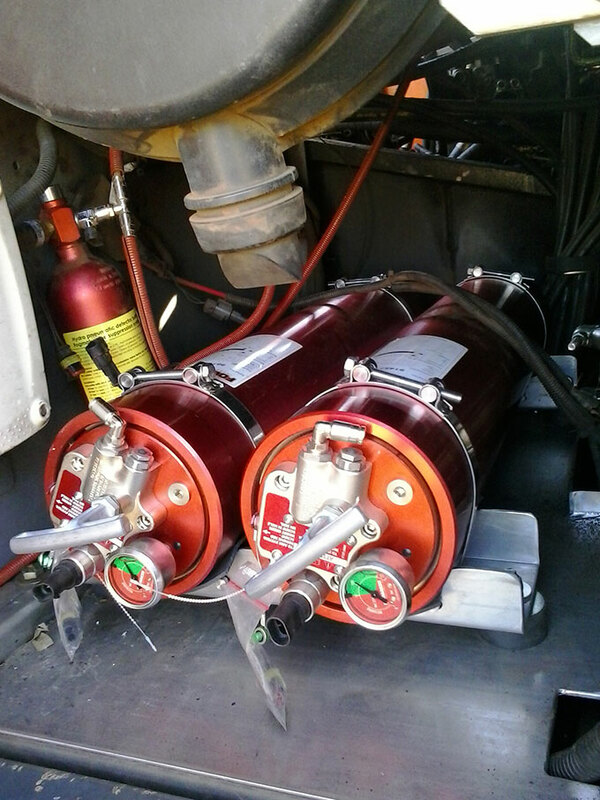 Fogmaker SA carries out all inspections and services of the Fogmaker fire suppression systems in six-monthly intervals. These are done on the customer’s site and can be completed in the 30-minute to 1-hour shift change. 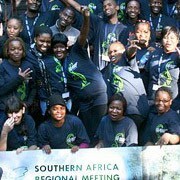 Full services are carried out every 3 years in accordance to regulations in South Africa. The Fogmaker fire suppression system is designed and manufactured in Sweden in accordance to ISO 9001 and ISO 14001 standards and has obtained approval from the Underwriters Laboratories (UL) in the USA, the Swedish Fire Defence Association’s SBF 128 and Australia’s AS 5062 standards. The fire suppression system boasts an installed base of over 150 000 units in over 55 countries in Europe, the Middle East and Africa, Australia and the USA. Fogmaker installation in a Tigercat skidder. Designed specifically for engine compartments and enclosed spaces, Fogmaker can be installed on virtually all forestry machines.